So you’ve decided to embark on an exciting, but daunting adventure: becoming a landlord. You have your ducks in a row to make the investment in your very own rental property, and you’re ready to roll. Now you just have to decide what type of property you want to buy—single family home, townhouse, condo, or small or large multi-family home? For many first-timers, answering this question can be a challenge. You want to make sure you get a good return on your investment dollar, but you also don’t want to get in over your head. To help you find the answer, below are some things to consider and key pros and cons I’ve encountered in my decades of experience investing in all types of residential rental properties. The condition of the property you buy should always be a top consideration. Any property in need of a lot of repairs is going to be a trickier investment. Consider the costs involved in repairs and how that differs among types of properties. For example, if the roof needs to be replaced for a house, that burden will be completely on you, but in a condo, the expense would be spread out among all the HOA members. With the rise of the house flipping TV shows, fixer uppers have become a popular buy. But be very careful. Like anything else, it’s never usually as easy as they make it seem on TV. I would not recommend a big fixer-upper to someone investing in their first rental property. Remember, while you may be getting a fixer upper for a lower price, you also have to put money—along with time—into renovations right off the bat. That will delay how quickly you can get a renter in there and start creating income. Homeowners’ Associations (HOAs) can be a real wildcard in your investment property—especially when it comes to townhouses and condos, but also with single family homes. As someone who works with HOAs, I can tell you they range greatly in terms of cost and what restrictions they have in place. Make sure you do your homework so you know the HOA fees and the rules they have in place before buying. You’ll also want to look into how financially sound the HOA is for your potential property. If they are not financially sound and will be doing special fee assessments every time your building has a need, the benefit of sharing costs among fellow owners is lessened. But, if it is a strong HOA (one with a good property management company at the reins), the fees you pay monthly will often outweigh the cost of paying for major repairs in a single family home. No matter what type of property you buy, one thing is key: location. You can fix up a condo, add curb appeal to a house, and even add on bathrooms or bedrooms if you need to, but you cannot change where the property is located. You’ll have a much tougher time renting out a great property in a neighborhood nobody wants to live in (at least for good market value) than you will an average property in a place where everybody wants to live. Always make sure to keep that in mind. 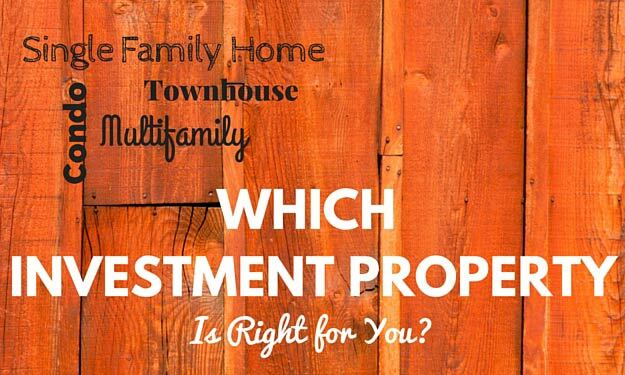 Which Type of Residential Rental Property Investment Is Right for You? The single-family home is a stand-alone residence typically designed for three to six people to live in. A single-family home in an established neighborhood where rentals are desirable can be a great choice for first-time landlords. A townhouse is a residence that shares walls with other residences. Most townhouses today are in planned communities. A townhouse offers a lower cost, low maintenance investment option. *Note: You may be wondering what is the difference between a condo and a townhouse. With a townhouse, you own both the interior and exterior of the building. In contrast, with a condo you typically own only the interior—while the overall building that houses the condos is owned by someone else. Condominiums (commonly called condos) can vary greatly in size and makeup. Some can be more like apartments or lofts in large buildings while others can be set up like townhouses. Like townhouses, condos also offer a lower cost and maintenance property versus homes. The HOA can also control your ability to rent your condo. Many communities will only let a certain percentage of condos be rentals (so make sure to look into that before you buy). A small multifamily house is generally defined as a residence with two to four different units—which can range in size. A small multifamily property requires more investment and involvement than the options above, but with a greater return. A large multifamily home is generally defined as a building with five or more units to rent out. Large multifamily properties offer the greatest income potential, but also require the most risk and upfront investment. If you’re a first-time landlord, congratulations! I’d love to hear what questions you have. Leave your comments below, or drop me a line anytime.